Port Orford is in on the southern Oregon Coast, at the northern end of what coastal Oregonians call the Banana Belt, because the weather from Port Orford south is noticeably warmer than the weather north of Cape Blanco. The town takes its name from George Vancouver's original name for Cape Blanco, which he named for George, Earl of Orford, "a much respected friend." Before the arrival of European settlers, the Port Orford area was originally inhabited by Tututni peoples. The Tututni languages were a part of the Pacific Coast Athabaskan language family. The first European settlers, led by Captain William Tichenor, arrived in 1851. Port Orford was formally founded in 1856. It would serve as a receiving port for mercantile and fishing. The port district was formally set up over 50 years later in 1911. …you’ll enjoy Port Orford. A place that feels a lot like Big Sur about 20 years ago. Port Orford is very artistic, with six art galleries owned and operated by local artists, it’s also a working fishing town with one of two dolly docks in the US. You'll enjoy a diverse collection of historical and naturally beautiful sites and attractions, as well as all sorts of fun options for recreational activities. The Port Orford Cedar Festival is an increasingly popular event featuring fine art, food, crafts, music, dancing, demonstrations and exhibit honoring the magnificent Port Orford cedar. Sat, 7 - 10pm: Dance with the Pistol River Social Club, Community Bldg. Fourth of July in Port Orford is what everyone imagines a small town celebration should be. In fact, our July 4th Jubilee is legendary and could be the largest celebration on the south coast - a four - five day event that offers something for just about everyone. The day starts with an exuberant truck - with loudspeaker! - that travels the length of the town, exhorting people to rise and shine and start the day with a pancake breakfast (someone always has a big community pancake breakfast...this year, it's by the Beachcombers ). Earth Day is Sat., April 20, and volunteers with SOLV are celebrating by cleaning up waterways, trails and public property in coastal communities. In Seaside, volunteers will join the “Scotch Broom Doom” to remove the invasive, yellow flowers. In Port Orford, Driftwood students will volunteer to restore a wetlands behind their school and establish a new trail, while educating others about the benefits of Oregon’s watersheds. Volunteers in Coos Bay will pick up litter and clear invasive species from the Wellbaum Memorial Trail and the Marshfield Pioneer Cemetery. They’ll also be cataloguing each headstone, photographing them, and removing invasive holly and ivy obscuring the stones. Dozens of projects with SOLV will be held across the state. This event is sponsored by Portland General Electric. What connects the highest peaks to the deepest oceans? Water. It is what nourishes our lush Oregon landscape, keeps our oceans alive, and sustains our way of life. Humans have an enormous responsibility to ensure the health of our water resource. The Port Orford Ocean Resource Team and the Surfrider Foundation invite you to share our vision of protecting our water as we ‘connect the drops’ from source to sea at the Port Orford Water Festival. 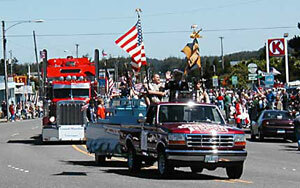 The pride of Port Orford opens to the public again April 1. Visitors are invited for the spring opening of the trio known simply as “the historic properties” -- the Cape Blanco Lighthouse, the Hughes House, and the Port Orford Lifeboat Station. And starting April 1, they’ll be managed by a new non-profit, the Cape Blanco Heritage Society, which is a merger of the Port Orford Heritage Society and The Friends of Cape Blanco. Of the three, it’s the lighthouse that is the star. More than 20,000 visitors each year tour the 1870 lighthouse -- the oldest continuously operating lighthouse in Oregon, says Milt Nelson, treasurer of the new group. The most spectacular sunsets. Mists hanging in the forest like Brigadoon. Bright sunny days where you barely need a sweater. Or nature at her wildest with tearing wind and rain. The storm watching is very cool. So is the whale watching. This is what makes WildSpring Guest Habitat so special. You can enjoy the best the spectacular south Oregon coast has to offer any time of the year. WildSpring is a small, eco-friendly resort in Port Orford, 60 miles north of California. Private and secluded, on five acres of old Native American grounds and with a zero carbon footprint, it offers comfortable luxury in a naturally beautiful environment. USA Today features WildSpring Guest Habitat as one of five luxury vacations in the U.S. and Spa Awards names the lodging property/spa as one of the top 100 spas in the country. The south coast is the place for travelers who want to get away from the same old thing - traffic, strip malls, franchise hotels and restaurants. Travelers who'd like to bring home tales of something off-beat, who enjoy exploring the special but quirky. Oregon's spectacular south coast is a world all its own, very different from its northern counterpart. It is remote, underdeveloped, without the crowds. A series of authentic small towns scattered along what could reasonably be considered the U.S.'s last accessible, affordable coastline. This is where the ocean and the forests meet the crashing seas. Where rivers pour into the Pacific and people enjoy long, empty beaches perfect for agates and driftwood. The alarming waterspout featured above formed over the Pacific Coast of Oregon, just offshore of Humbug Mountain five miles (8 km) south of Port Orford, Oregon. From the Sierras to the Smokies, from "sea to shining sea" and all the wild places in between, America’s wilderness is an indelible part of our national heritage and an important legacy to pass on to our children. Pristine, undeveloped wilderness is important – not only in its own right, but for the clean air and water, recreation, and wildlife habitat it provides all of us. But these wild places are constantly under pressure and need protection in order to thrive. And now there is a new program that makes it easy for winter travelers to support those remaining wilderness areas - WinterGreen Vacations. International talks on climate change begin next week in Copenhagen, Denmark. For months Denmark, Oregon has been considering the impact of climate change on their small town. ... the Denmark Project, producer Christy George found new voices – psychologists, philosophers and poets - wrestling with the enormity of the changes facing the place they call home. The Klamath-Siskiyou ecoregion of southwestern Oregon and northwestern California is a world renowned hub of biological diversity. The mountain ranges and river valleys that define this region are some of the most spectacular in America. "We have a great parade, lots of events to participate in or watch,an incredible fireworks display with dedications available. Come and celebrate at Paula's. We will be hosting a wine tasting with Wild Rose vineyards from Winston Oregon. All their wines are organic and flavorful. Stay two consecutive nights and pick up a free night of camping at any of the 20 Oregon State Park campgrounds that don't take reservations. The promotion runs through Sept. 30 and is designed to get campers thinking about staying in some beautiful state parks that are lower in demand, mainly due to their location in less frequented parts of Oregon. Cape Blanco State Park, next to Oregon's oldest lighthouse on the westernmost tip of the state, nine miles north of Port Orford. Humbug Mountain State Park, six miles south of Port Orford, has the state's largest number of non-reserveable campsites (94), and the distinction of being the first state park campground built on the Oregon coast. Carl Washburne, 14 miles north of Florence, and Alfred A. Loeb, 10 miles northeast of Brookings. Read the entire OregonLive article "Camping: It's an Oregon Value"